If you’re like me, the first warm days of spring hit and you want to start planting. I’ve come up with some creative ways to get plants going faster and get you to your harvest sooner. You can plant in your garden the old-fashioned way, or you can take a look at some of the inventive greenhouse ideas here. The first is the soda bottle. You can turn it on its side, cut a hole in it, add soil, and plant your plants. Be sure to cut drain holes so your plants won’t drown. The bottle will heat up faster and hold the heat better, giving your plants a great environment to get going. Just don’t let them get too big before you take them out. 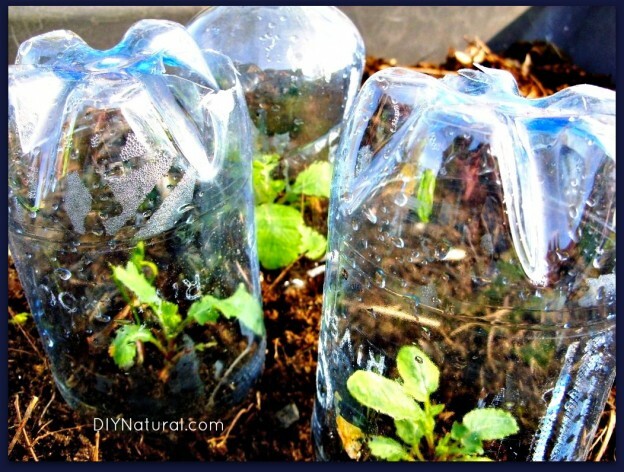 You can also cut your soda bottle apart to make a greenhouse. Put drain holes in the bottom and plant your plant or seeds. Then water and cover with the top. You can leave the cover on during cold days or take it off to provide ventilation. If it’s really nice out, you can take the entire top off. 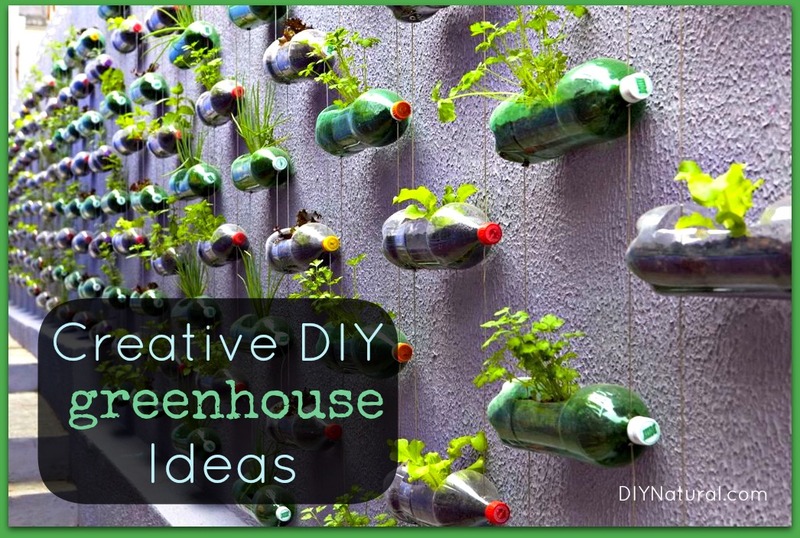 Or…use half of a soda bottle on top of a pot. It’ll keep moisture in and provide a wonderful environment. How about take-out containers? Not to long ago I took home leftovers from a restaurant. The takeout container was black with a clear domed lid. A few holes and I’m set! What about cake and muffin containers from the grocery store? Though these are more fragile, they’ll get you through one season. Then, recycle them and start with fresh ones next time. This gives the added benefit of getting rid of any disease or insects that may be present. Plastic storage containers work great for multiple plantings. Use clear 18-20 gallon containers for best results. I was at the Men’s Garden Club of Asheville one year for their propagation seminar, and this is what they used to root rhododendron cuttings. They placed a tray of soil in the bottom and wet it down thoroughly. Then they took cuttings, dipped them in rooting hormone and placed them in the soil. Then they covered it and left them for a few days. After a while, they angled the lid and provided aeration. The cuttings rooted much faster because of their environment. Don’t throw out your clear plastic bags. Place them over a pot you’re just getting started. They’ll keep heat and moisture in. And want to make your own slightly larger mini-greenhouse? Take a few tomato cages and cover them with a clear shower curtain. You can get one at most dollar stores, or use one you’re getting ready to throw out. Secure the plastic to the tomato cages with clothes pins. With these ideas you’ll be able to get a jump on the season. And maybe not feel guilty about taking home that tomato plant you just had to have in March! Do you have creative greenhouse ideas you use to get plants started? Share below! I have raised vege gardens and because it is autumn here and frosts are pending, I have made a hoop system to cover some of my vege boxes. The hoops are about 80cm high above the beds and I can cover them with bird netting, shade cloth, wind break or plastic. In mid summer I used a sheet for shade and then that was changed to bird netting to keep the butterflies out and next project is to make plastic hats to protect my late tomatoes and peppers from frosts. I rinse out my tin cans and drill a hole in the bottom. Great for starting in the house. I then place them all in a clear plastic container (easy watering and carrying in and out of house on cold nights) . Plants grow bigger and have better roots. For the gardeners low on space, my herb garden is attached to my railing. It is simply a 10ft length of gutter with endcaps in place. Few holes drilled for drainage and it is the perfect size. Great article, great ideas! I’m featuring the post on my Facebook page – http://www.facebook.com/simpledailychange – on Tuesday, April 9th, at 4pm PST. I love this site! You all are so helpful and creative thanks again. I can’t wait to get started. Thanks so much I have so much fun writing these articles I just have a hard time deciding what to do next! Let me know if you have any questions. I’ll be happy to help. I’ve planted on straw bales for the past couple of years. Sooooo much easier than wrestling with big tubs and lots of dirt. I zig-zagged a soaker hose across the top and turned it on every evening for awhile to keep them lightly moist. I had to give a sprinkle of miraclegro every two or three weeks to supplement, but it was still so much easier than soil. The first year I grew watermelon, a bunch of acorn squash, and had a very nice crop of butternut squash setting on when a late season hail storm wiped everything out. Last year I planted tomatoes on two bales and two zucchini plants on a third bale. I can’t wait to thy the hay bale method. And I made my own soaked hose. I had a hose with a hole in it, so I just added a few more holes and used a bar clamp tha I had on the end. Free soaker hose! Im excited to try a cloth raised bed this year. I might even try out the straw bale technique since the soil in my backyard is very poor. Thanks for all the great suggestions!!! Im just about to plant my seeds and now I have so many ideas. I’ve never done either, but I will be this year. I’ve never had the room before, bit now I do, so I can try all sorts of things. Thanks for the reminder! I am anxiously awaiting the arrival of your DIY naturals book. I ordered off amazon Monday. I use cardboard tubes from loo rolls. I bash one end a bit to bend it under a little, add potting mix and a seed. Write the plant name on the roll. I sit these packed together in a tray and cover with a plastic carrier bag. If u pack the tubes together, they don’t tend to break down as fast as they do individually. When plant is ready to plant out, unfold the bottom and plant whole tube as well, this rots down in the ground. I use this for cabbages, lettuces, beets etc, but tomatoes, corgettes, cucumbers and pumpkins need longer before planting out, so they need less biodegradable tubes. Another idea I’ve never tried, but have heard of. I’ve been saving my carboard tubes for firestarters for my woodstove, but I’ll try this too. Thanks! Now that’s a great idea. I’ve never thought of that, but I can see how it would work. Thanks! You’re welcome. The nice thing about the pretzel barrels is that they are so sturdy, they can be run through the dishwasher for easy sanitizing. I have some that are 10 years old – and still perfectly sound. My tomatoes go out weeks before our last frost date here in Michigan, since I use black plastic garbage bags to help warm the soil. You can also wash out an egg shell, poke a hole in the bottom, put seed starter in it, and use that for seeds. You can then put the whole thing – soil, plant, and egg shell in the ground when you plant the seedlings in the garden. Old aquariums also work well as greenhouses. You can buy plant lights that fit in the lid. I’ve never used eggshells, but I’ve seen it done. I have Americaunas that lay blue-green eggs, so it could be really cute for klids to do them as a project. Hmmm….And I have seveal aquariums that I use. I got my last one, a 30 gallon used tank, free from a woman on Freecycle. If you’re not familiar with it, check it out. freecycle.org. There’s prbably one in your area. Any item with a recyclable number on the bottom (1 – 7) goes to the recycle bin and the soda and WATER bottles are returnable to the store for a deposit. Would love to see some ideas that work with items that cannot otherwise be kept out of the landfill. Push your state for returnables – there are many more people drinking bottled water and soda than gardners! That’s true, and I do use my bottles until the break, then they go in the recycling. I’ll look a other things that might work and post them in an upcoming article. Thanks! If you like these ideas check out window farms it is a great idea for those of us that do not have any place for a garden. Just remember that the newer windows are UV protected, so even in full sunlight, you may need to provide more light. And you may need to pollinate artificially too. But..it can be done! It seems I might figure out how to hang these bottles like in the picture, but it would be great to know how they were done. Might save me some time! Thanks….. They show you how to hang them here. Matt, thanks for your help on the hanging greenhouse, but…. The instructions are in Spanish. I had to laugh. Oh, well, I’ll figure it out with some experimentation. Thanks, again.. Copy the link address and paste it into google search. Next to the listing on there should be “translate this page” in blue. Hello I’m new to your site, wondering if this would work for an herb garden, I have no place for a real garden but would like to try my hand in herbs. Thanks. An herb garden is a wonderful idea… it would work just fine…and I think Ill do that too! These methods would be perfect for herbs. I specailze in them on my farm and use the soda bottles all the time. My worry with doing something like this are the BPAs that would seep into the soil and plants. Use BPA free plastic containers. I did some research with the BioBusiness Network here in Asheville, NC and they said that the amount of BPA that gets into the soil is very minimal, the amount that gets into the plant, even smaller than that and the amount that actually gets into the fruit or vegetable is almost nonexistent. You would have to eat lots of tomatoes (for example), like hundreds of pounds, for it to effect you. Thank you for these interesting ideas, I just love these ideas in general. I do not have a garden and all the little ideas are awesome. Many people live in small homes with small paved ‘gardens’ so every little bit of alternative gardening is interesting. I started doing container gardeneing classes for just that reason, but then when I moved here, I found out the soil is terrible: wet clay, or really dry and compacted, acid soils and lots of rocks. Containers just made sense. I save my husbands coffee cups and lids. I start seeds in them and put the covers on. Once the seeds have germinated I take the lids off. Make sure to put holes in the bottom. Great idea! I always thougt the continers had to be clear, but now I’m seeing that they don’t.